The trendy titanium jewelry market has been expanding and with it, the look and style of titanium rings have evolved. Titanium jewelry allows you to make a modern statement with your jewelry. This sturdy metal is virtually indestructible and won’t tarnish or fade with age as gold sometimes can. Your creativity will allow you to achieve a number of creative ideas. At Titanium Style, we take pride in our creative side and encourage our customers to experiment with a number of unique titanium jewelry designs. The beauty of titanium metal is it gives you tremendous versatility. Try a titanium wedding band for durability that will last forever. Titanium wedding bands for men are the perfect alternative for those looking to avoid the old-fashioned look of yellow gold. With the modern, chic look of titanium, there are a number of possibilities to add a classy and unique piece to your jewelry collection. Whether you want to add stone sets, texture or a pop of color with precious metal inlay, Titanium Style will help you achieve your vision. We will help you create a one-of-a-kind titanium jewelry masterpiece. 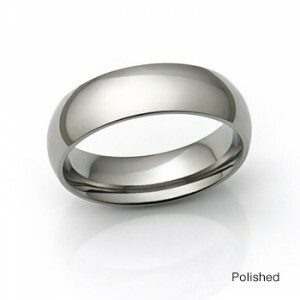 If you are looking for a custom-made wedding band, consider a titanium ring for your loved one. The strength and stability of titanium will last years. 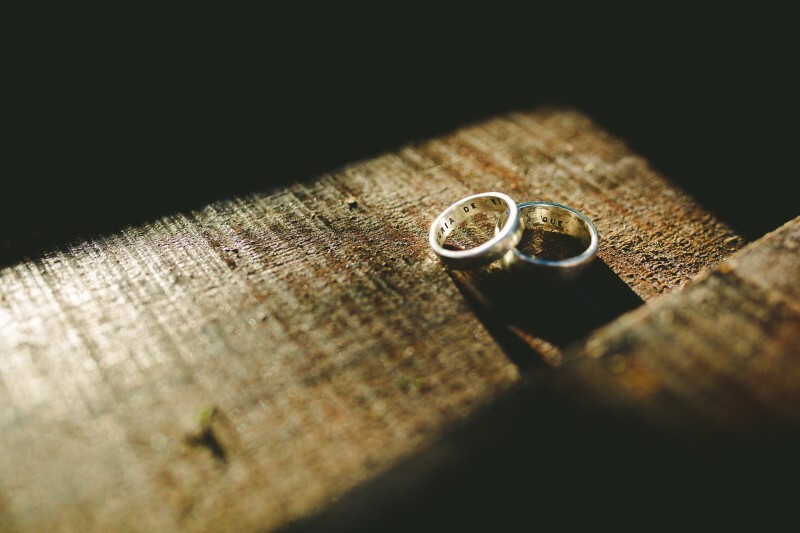 With traditional gold wedding bands, you can easily see tarnish or scratches on them and sometimes it can be extremely difficult to remove them. Titanium rings do not show wear nearly as quickly, nor are they easily damaged as gold is. They hold up to your day-to-day life and are perfect for blue-collar workers who work heavily with their hands. Titanium Style offers you a variety of titanium ring design schemes and ideas. If you want a ring to symbolize your love for your partner, get a ring that lasts forever. The Titanium Infinity Ring is a double loop, which is also the symbol for infinity. This durable titanium ring will last just about that. Perfect for a wedding band, this titanium ring is the perfect gift to help celebrate your special day and the memory will last a lifetime. Also great for anniversaries, this titanium wedding band is for couples that have stood the test of time. Our wedding bands are customized to your needs, so you can choose from the polished finish, brushed or even a unique combination of the two. If you love titanium jewelry but are looking for that special pop of color or even a touch of elegance, try something different that will catch everyone’s eye. Consider adding a gold inlay or precious gemstone in your titanium ring. Our rings are available with accents of white gold, traditional yellow gold or even platinum inlays for a unique and dazzling shape that is sure to please. Depending on the look you are trying to achieve, our titanium rings are extremely versatile and will be a stylish, blank canvas for you to create a masterpiece. Our gemstones will also enhance your modern and elegant style with ease. For the perfect addition to any custom-made titanium ring, add a diamond, black pearl, emerald or sapphire to your ring. They are the perfect custom wedding bands for your significant other. Not only will these features add a classy touch to your jewelry collection but they will let your partner know how much they mean to you. Titanium rings not only make a fashion statement, they can also reflect something much more sentimental. Our cross-cutout titanium ring will make a perfect promise ring or a devotional gift for anyone. It’s not only a stylish gift but has a deeper spiritual feel to it as well. Attach a gemstone in the center of the cross for not only a pop of color but to enhance the elegance. These cross titanium rings are also perfect gifts for your godchild. For a unique twist on contemporary design, custom order your ring with a textured finish. Try a custom-made titanium ring with a sandblasted finish to really create something special. 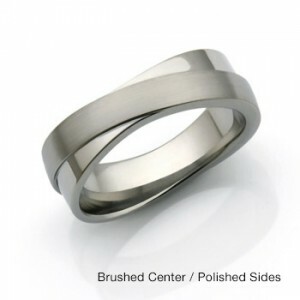 Add an aged texture to your ring and give your titanium jewelry a little bit of depth with our sandblasted finish. This is especially fashionable for a vintage or rugged scheme. The color will really make your precious metal inlay colors pop against the darker, textured surface. Titanium earrings, necklaces and bracelets are also a must for any collector. If you are looking to purchase a men’s cross necklace, check out our various titanium necklaces for the special man in your life. Check out our women’s titanium necklaces as well for a gift that is truly from the heart. 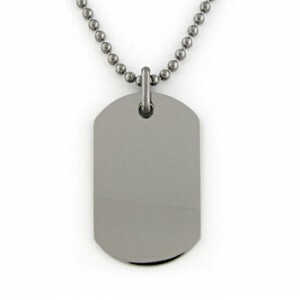 Customize our titanium dog tags for men or for women for that loved one serving in the military. This is a great gift idea to tell someone “thank you for your service” and leave them with a special message that they can treasure forever. Engrave a name or personal message on this titanium plate for something memorable that your loved ones will cherish forever. The versatility of titanium jewelry has expanded even more than before. If you are looking for a titanium ring that is different from everyone else’s, consider a hammered effect. 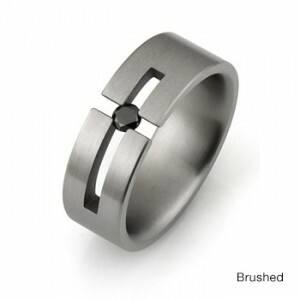 This will give your ring an antique or archaic feel, as the dark contrast complements the silver color tones perfectly. However, if the textured titanium band look is not for you, try a ring with beveled sides for a chic pattern to break up the surface a bit. For the car lovers in your life, get a titanium ring designed to look like a car piston. Perfect for those who know their way around under the hood, this titanium ring will be a muscle car owner’s prized possession. Make it a custom-made wedding band to make your day that much more personal and special. 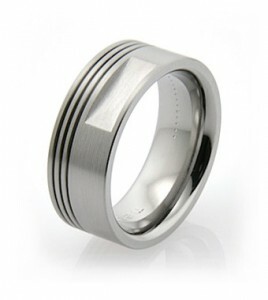 Our titanium wedding bands for men are sure to impress. 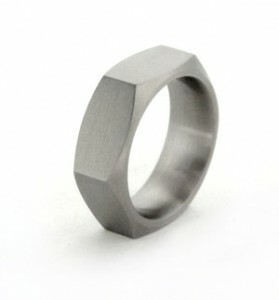 We can also shape our rings to look like a nut to really surprise the handyman in your life. Check out all of our clever shapes and forms or even suggest your own. We would love to work with you to make your titanium jewelry your own. Don’t forget our ring size guide to help you fit your custom made-wedding bands perfectly. This will help ensure your titanium bands fit perfectly when they arrive. Whatever your style may be, we have your titanium jewelry covered. Contact Titanium Style to get the chic titanium jewelry piece that your collection is missing.